This screen restated that my current Tivo would stop recording off the air on 2/17/09 unless I bought a digital converter box and waited for their automatic service update to recognize it. My other choice was to upgrade to a Tivo HD DVR. But I want to use my Tivo now! (Or what to do in the meantime). If you love the idea of switching to free digital tv now, but don’t want to give up Tivo, you have three options. 1. Continue to use your Tivo to record analog TV and watch live TV via your digital receiver or flat screen TV. This involves getting an antenna splitter (about $7) and using the same antenna to receive digital tv (using your converter box or flatscreen TV) and your old Tivo. This takes just a few minutes to set up and is a workable temporary solution, however the quality of your Tivo recordings will be about the same quality as old fashioned rabbit ear reception. 2. Buy one of the few combination satellite / digital receivers which Tivo currently supports and use this to record digital TV on your current Tivo. These can be found on ebay for about $50. Note: I’ve read about people who have gotten this setup to work, but it looks tricky. If you are very good with gadgets and don’t mind spending a LOT of time getting this to work, here is a link that might be helpful. 3. Or just upgrade to one of the new Tivos that support digital tv reception (ATSC).Both the Tivo Series III and the Tivo HD support direct ATSC reception. This means that you just plug your antenna directly into the Tivo (no digital converter box needed) and watch and record free digital TV through the Tivo. Of the two models, the Tivo HD is much cheaper and should be enough (180 hours recording time in standard, 20 in HD) for most people. Don’t be fooled by the HD in the model name. You don’t need a HD TV to use it. 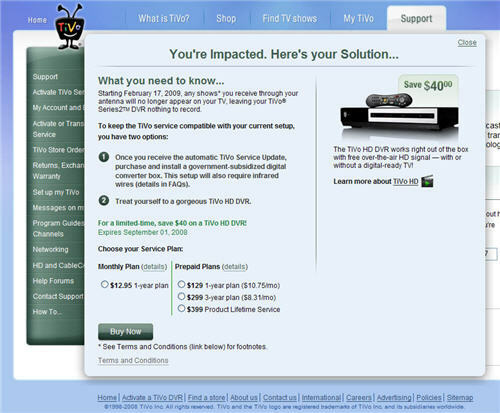 Tivo sells the Tivo HD directly via their web site for $299 and is currently offering a $40 discount to certain Tivo customers (with a 12 month contract), but Amazon.com is currently selling it $254 here and it’s been recently sighted for as low as $225. We chose the first option for our first several months. This worked out OK since we watched most shows live on digital TV or watched them later via Hulu.com. I guess all the digital tv got us spoiled, since we just broke down and ordered a Tivo HD. We weren’t crazy about spending the extra money, but the new Tivo will let us eliminate our converter box and finally have one box (and one remote) to control everything. And selling our old Tivo and digital converter box on ebay should let us to buy the new Tivo for about what we used to spend on one month of cable. Once we get it, I’ll try to post a review of Tivo HD and compare it’s reception to our current digital receiver. This entry was tagged ATSC, broadcast digital, Tivo. Bookmark the permalink. One of the things we discovered with our HD TiVo is that I had to manually tell it which digital channels we got over the air. We were nervous at first because the reception (of the analog channels) was fuzzy and bad, but then I figured it out. I am sure that there is a cleverer way to do it, but this worked for us. It’s just something to be aware of if you decide to go this route. Once I manually entered in the channels, it was fine and not a problem. Of course I bought one of the few converter boxes (DISH) which in no way cooperates with my old TiVo box. But I am able to connect my antenna to the converter box, the box to TiVo, and Tivo to the TV. Since the box only outputs to channel 3, I set TiVo to channel 3 only, and use the converter remote to change channels. To program ahead, the DISH box has a nice TV-guide which you can select channels to switch to, even repeat recordings. After I set that up, I have to program TiVo to record at the same times, but ALWAYS channel 3. It works! Here close to Boston I get over 10 channels and get to record many movies. Doesn’t anyone wonder why, before and certainly after the digital transition, that there are NOT digital DVRs with built in Digital tuners, to replace all the VCR’s that now no longer function in US households? A few do exist for $700-1200, that have mixed reviews. Plus some jerry rigged setups using PCs, or the TIVO with a SUBSCRIPTION FEE. Where are the cheap TUNER/HD/DVD burner units? We all know the Japanese and Taiwanese could pop these out for $99-199, so what gives? This is another reason that many give for giving in. I expect to see all providers offering some on-demand box like mentioned on this site soon. This might explain the lack of consumer choice hardware for cheap. 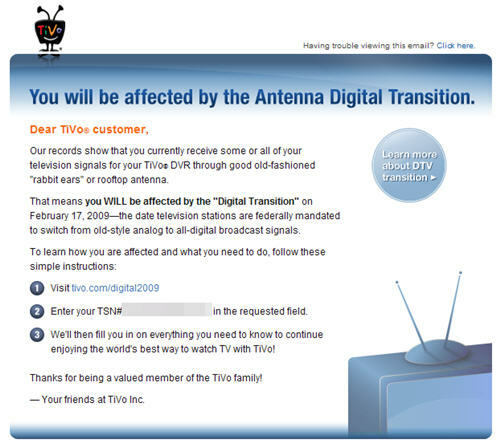 I just ordered the Tivo Premiere, antenna, and wireless adapter to get the signal from the computer in the office. Hopefully, when I get it all set up, I can disconnect the digital cable box for good and return it and never have to have cable tv again. I can’t stand cable companies!